EXPLORE THE UNEXPECTED. The leading fertility clinic in North Cyprus, euroCARE IVF, offers intended parents an extraordinary opportunity to attain their dreams of parenthood. Traveling to North Cyprus for fertility treatment grants you access to not only top fertility care — but also relaxing moments on golden beaches, thrilling sight-seeing adventures, tours of the beautiful countryside in the Karpaz Peninsula, and views of the glorious mountains covered in shady pines forests. The natural beauty of the island gives you a complete sense of peace and comfort. 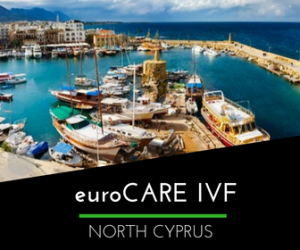 North Cyprus is the perfect place to escape the pace of every day life — ultimately giving your IVF treatment a higher chance of success — as you unwind in a relaxing, stress-free environment. Ercan airport is the closest to the clinic and hotels. From here when you land you have approximately a 40 minute drive to your hotel. All flights to North Cyprus will stop in Turkey as there are no direct flights to the North of the island. Normally you do not need to collect your luggage which will transit through to the next flight and so it is simply a matter of changing plane. Turkish Airlines are the biggest airline flying to Ercan from most worldwide locations and offer reasonable prices. Larnaca airport is based in the South of the island. You will find direct flights from most European countries into Larnaca. From here when you land you have approximately a 1.5 hour drive to the North of the island. Many airlines fly into Larnaca such as British Airways, Cobalt, Easyjey, Monarch, Emirates, KLM, Aegean Air, Lufthansa to name a few. No worries, our dedicated drivers will collect you from either airport. A valid passport or identity card is required. Visa regulations apply to crossings from South Cyprus. NOTE: The nationals of the Federal Republic of Nigeria and the Republic of Armenia are under obligation to apply in person to a TRNC Representative Office abroad to obtain a visa prior to traveling.